We love books, so we are super excited about this workshop at the Georgia O’Keeffe Museum this Saturday, April 13th. 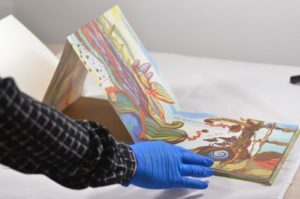 The 4 hour workshop will focus on handmade books – viewing artist-made books in the museum’s collection and creating your own books using three simple structures, such as the pamphlet stitch, folding techniques, and how to create a nontraditional book structure. Beginners are welcome and all supplies will be provided. This workshop is being held at the Museum Education Annex at 123 Grant Avenue from 9:00 am – 1:00 pm. Cost is $60 or $45 for members.